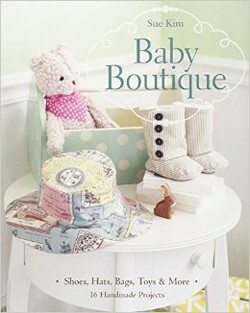 In this charming how-to book Baby Boutique, designer Sue Kim puts her signature style into 16 projects to welcome a new baby. You'll find patterns for hats, bibs, booties, blankets, toys, diaper bags and so much more. All the projects are presented with beautiful photography that highlights various infant-friendly fabric options. A comprehensive section on sewing basics makes the book exceptionally easy to use. There's even an innovative eco-friendly gift wrap chapter to help you showcase your lovely gift. After all, there’s nothing more heartwarming than a handmade keepsake for a little one.